Find yourself free on a Tuesday or Wednesday evening this summer? 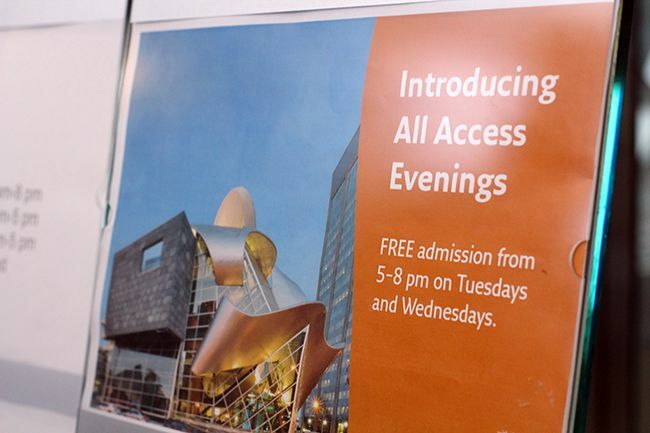 The Art Gallery of Alberta has started offering public admission free of charge on Tuesday and Wednesday evenings from 5-8pm. 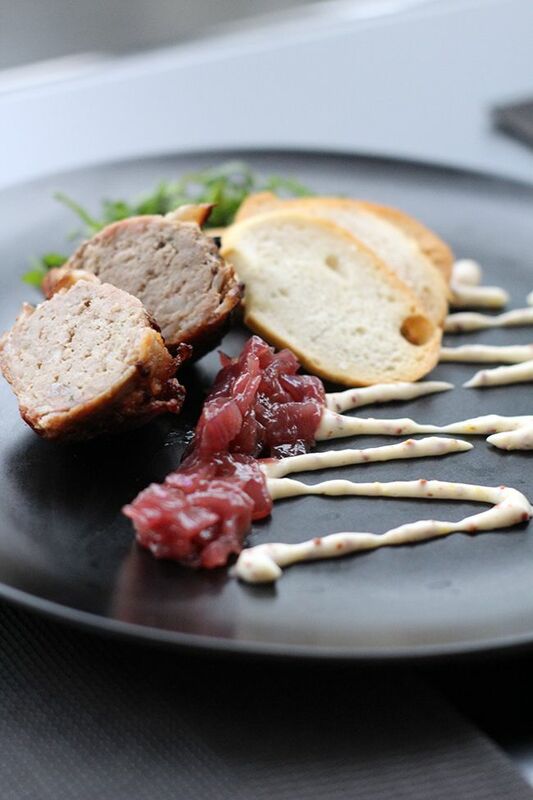 To sweeten the deal, Zinc Restaurant inside the gallery is offering a fantastic Tapas Tuesday menu to celebrate. Chef David Omar has put together an array of dishes on the Tapas Tuesday menu which is available only on Tuesday nights - sorry lunch lovers! 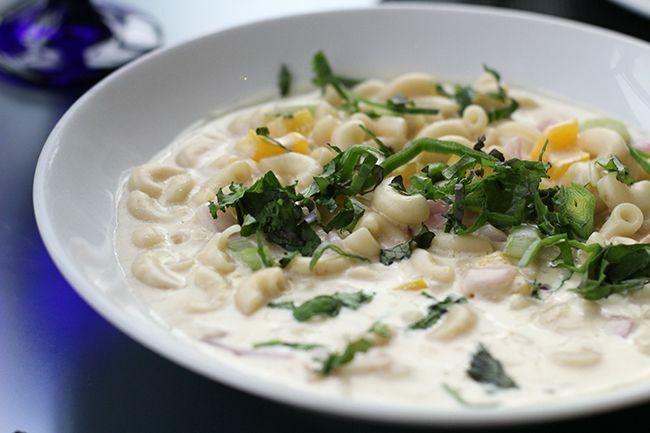 There's a wide range of dishes available, many of which aren't available on Zinc's regular menu. As tapas are meant to be small shared plates, grab a couple friends and go for a stroll through the gallery before settling in for your meal! I had the opportunity to taste many of the dishes on the tapas menu, but we made the mistake of dining first, only to realize that the gallery had closed just as we finished our dinner. The Tapas Tuesday menu features 14 dishes, and our group ate our way through just about all of them! 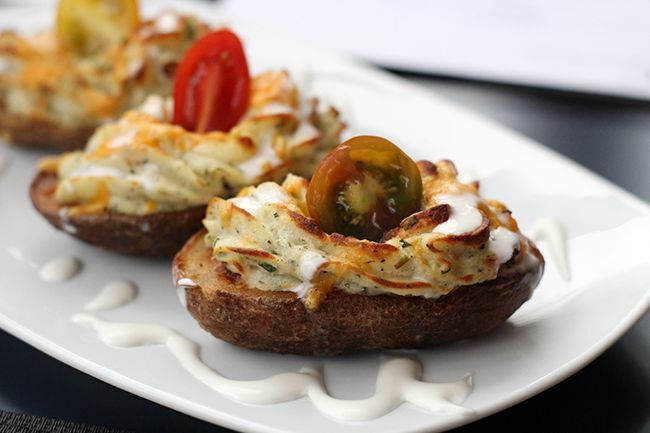 First up came the Potato Skins ($8) dressed with cherry tomatoes, green onions, cheddar cheese and sour cream. The DLT ($12) piqued our interest, and turns out this acronym stands for duck, lettuce, and tomato. 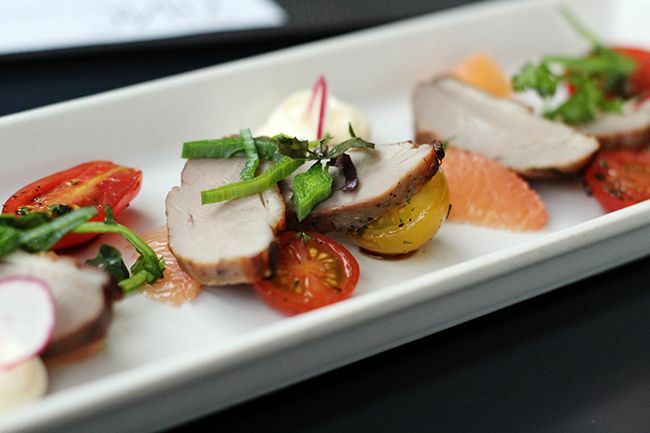 The tea cured duck breast paired well with heirloom tomatoes, microgreens, fresh citrus segments, and a tarragon aioli. The dish was light and fresh, and we all agreed it was one of our favourites that night. See this burger? It's probably the best deal you'll find anywhere this summer! 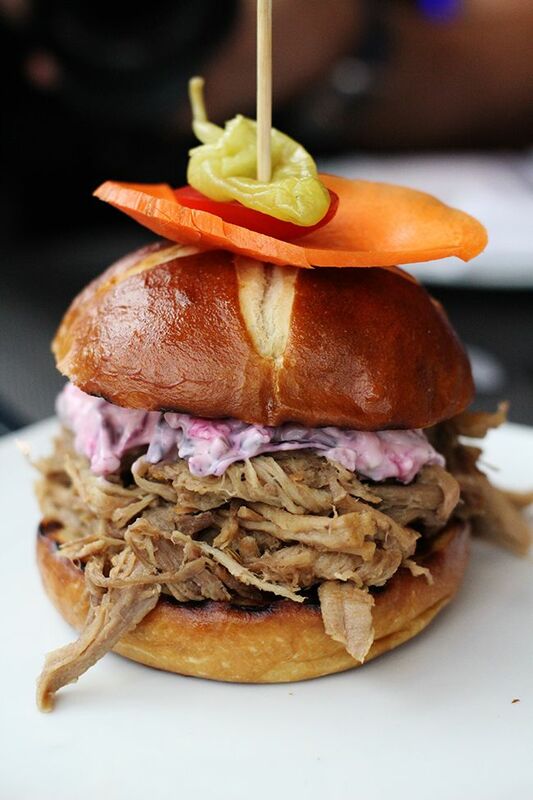 Priced at just $4, this Pulled Pork Sandwich on a fresh pretzel bun with mayo, coleslaw, red onion, and pickles is enough reason to stop by Zinc on a Tuesday night. You really can't go wrong. Escargot ($7.50) isn't an item you'll typically find on menus in Edmonton, so it was nice to see something different! 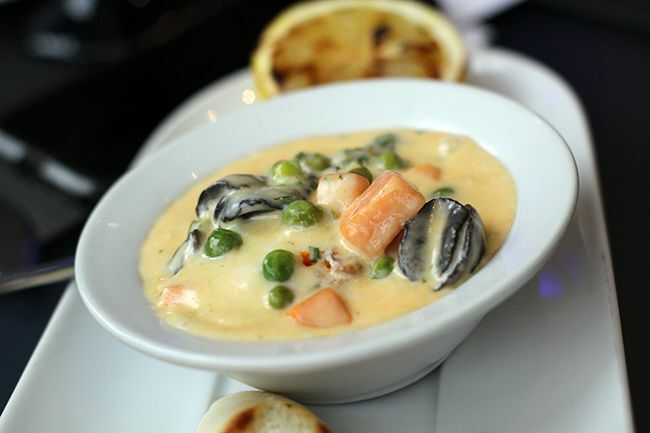 The escargot are cooked in a flavourful cream with shallots, chorizo, green peas, sweet potatoes and gorgonzola. The Wild Boar Terrine ($18) was quite different from what we expected, resembling more of a meatball than a traditional terrine. Plated with onion jam, dijon aioli, and crostini, the terrine was good but we all felt the portion didn't justify the price. 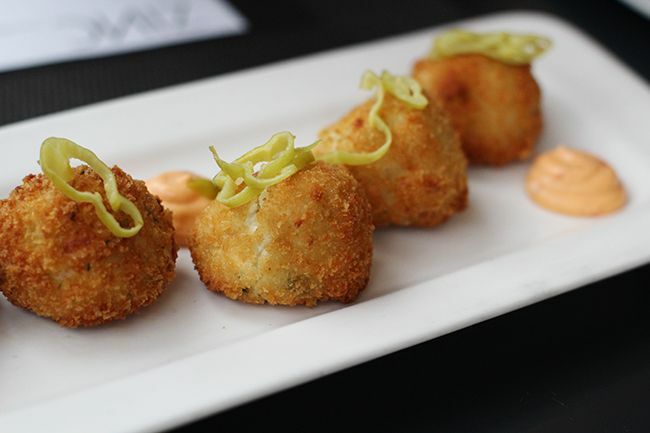 The Croquettes ($10.50) made with cauliflower and feta were a great sharing dish for the table. Finished with garlic chili oil and topped with pepperoncini, the croquettes were crisp and had a nice kick to them. Chef David Omar hasn't forgotten about the vegetarian crowd, and this Raw & Roasted ($10) vegetable dish is as tasty as it is pretty. 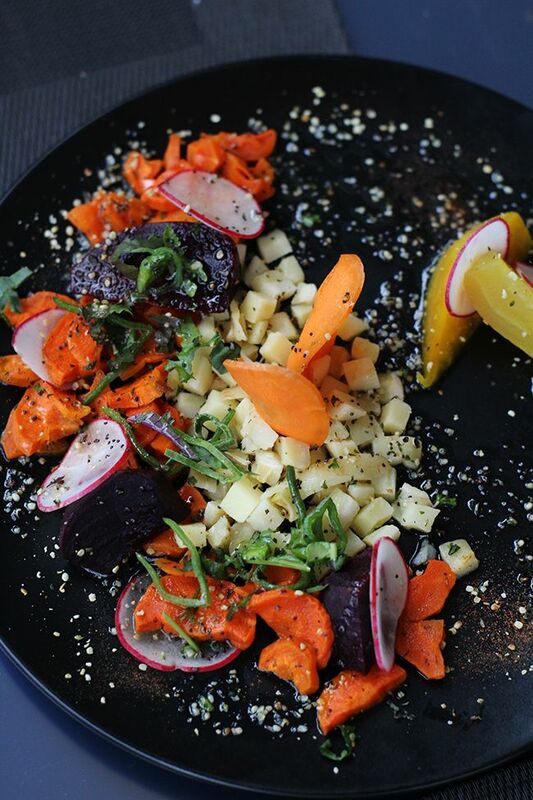 Beets, carrots, parsnips and radishes are tossed in a maple poppy seed vinaigrette and finished with hemp seeds and tomato dust. 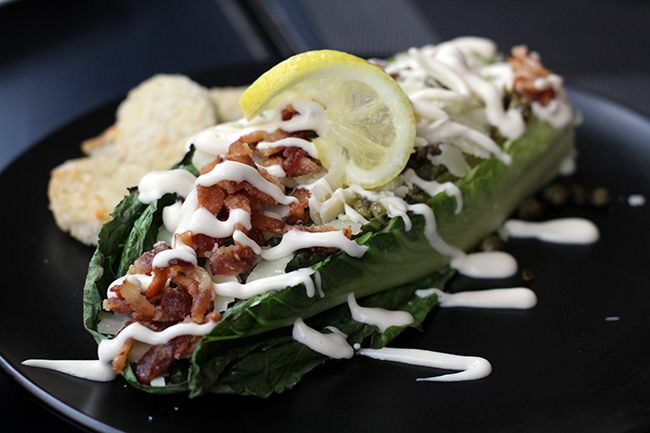 Grilled Romaine ($9.50) is becoming quite popular on menus in the city, but I'm not complaining as I'm a huge fan. The romaine on the Tapas Tuesday menu is dressed with a confit garlic emulsion and finished with parmesan croutons, maple bacon, fried capers, and preserved lemon. While the romaine could have spent a little longer on the grill, I enjoyed the different textural components from the capers and croutons. 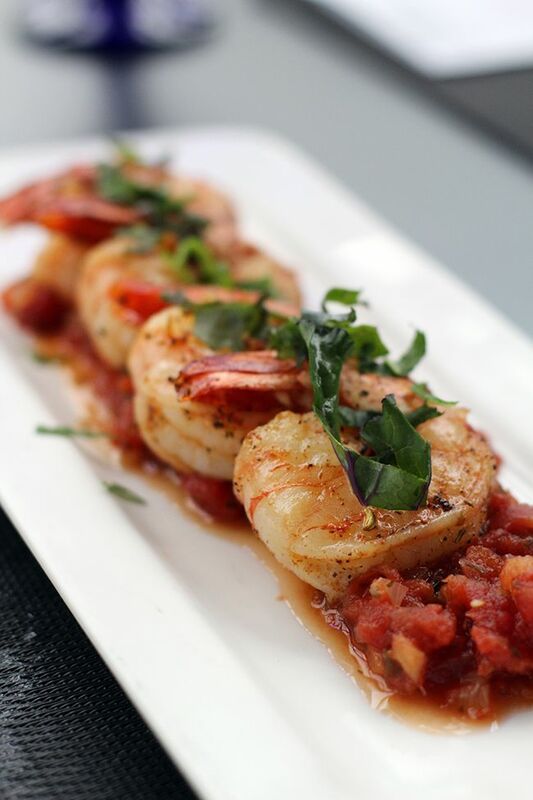 The Sweet & Spicy Prawns ($12.50) cooked in ginger mango chutney were a great sharing size. The prawns were juicy and flavourful with a little kick! The Tapas Tuesday menu offers a weekly Macaroni and Cheese feature ($16), and the offering for the night was a vegetarian version with peppers, celery, and green peas. Unfortunately this classic comfort food dish was a disappointment for us that evening. The sauce was runny, needed more seasoning, and didn't feel like good value for $16. 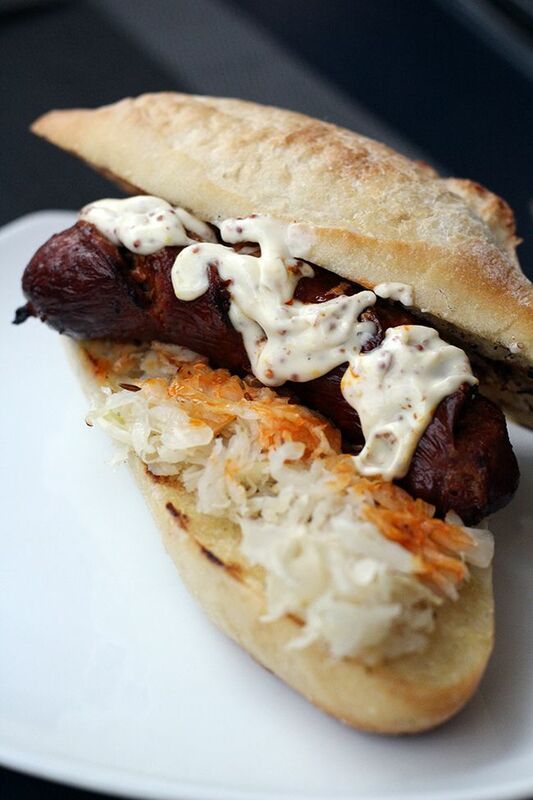 Last but not least we opted for the Sausage ($9), where grilled chorizo was served in a demi-baguette with sauerkraut and dijon mustard. It was a tasty, hearty offering, but difficult to share among the table. With great dishes at good price points, it's a no-brainer to have a Tuesday date night at Zinc and the Art Gallery of Alberta. Tapas Tuesday will run throughout the summer and potentially into the fall with an updated menu depending on it's success. You would be surprised how many Edmontonians have never stepped foot into the art gallery, and if you fall into this category, there's no better time than now! 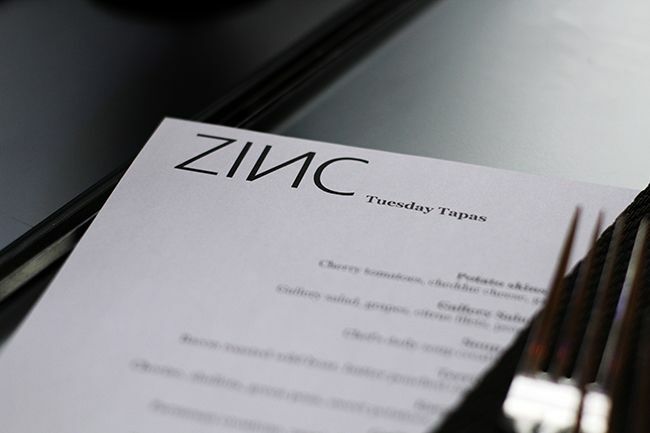 *Disclosure: I was invited to a menu tasting for Tapas Tuesday at ZINC. Views expressed in this post are solely mine. This post is 100% my opinion, and as always, my priority is to you, the reader, to present an unbiased, thorough review. Edmonton has been waiting a long time for Hawaiian poke. I've tried variations of the dish on menus, but none of them have been true to the Hawaiian classic. 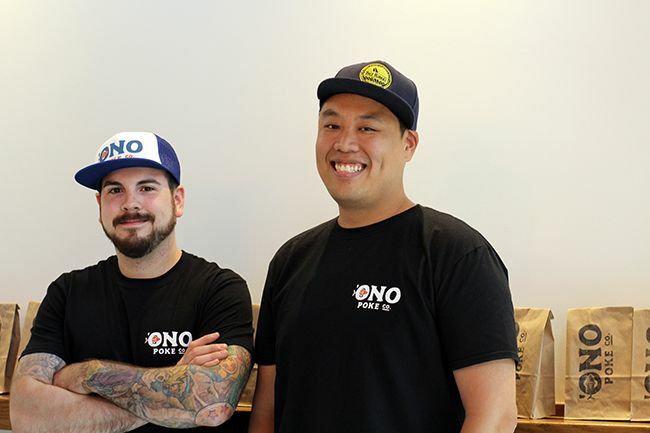 Just weeks after the opening of Edmonton's first poke spot comes 'Ono Poke Co., promising to bring authentic poke to the prairies. 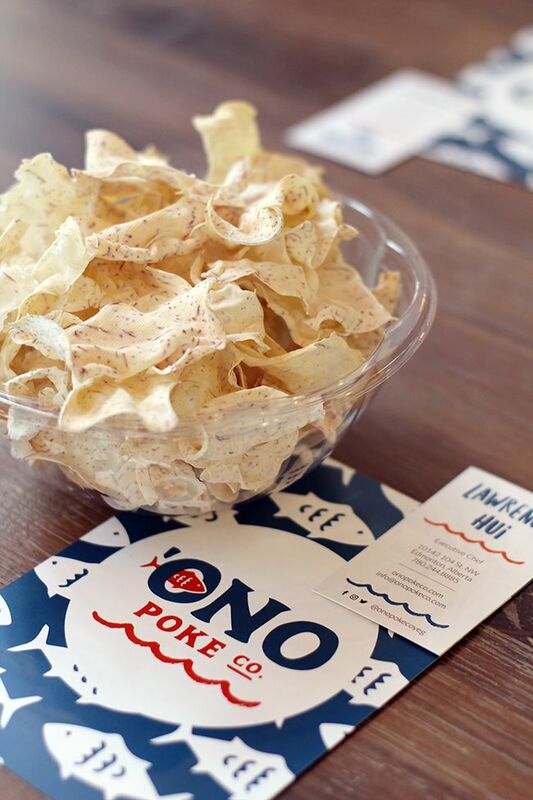 In the Hawaiian language, "ono" means fish and "'ono" means delicious. It's a play on words, and either would be quite the fitting name for Edmonton's newest poke place if you ask me. 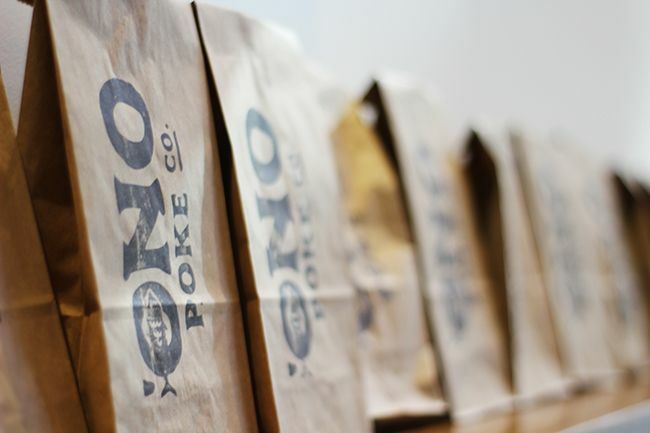 'Ono Poke Co. is slated to officially open to the public tomorrow (June 3rd), but I was lucky enough to get a sneak peek earlier this week with a group of friends. In early May Chef Hui travelled to Ka'anapali Beach in Maui, spending a week learning from some of Ka'anapali's top chefs and immersing himself in Hawaiian culture. 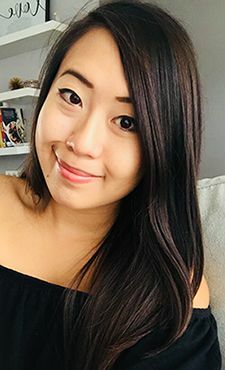 It was important that he understood the roots of Hawaiian cuisine so that he could rightfully present the food and honour the ingredients back home in Edmonton. Each chef he spent time with shared their stories around Hawaiian culture and traditions and shared their versions of traditional and modern poke. Chef Hui had drafted a menu for 'Ono Poke Co. prior to his trip, only to completely change it upon his return to reflect what he learned while in Hawaii. If you've ever been to Hawaii you'll know that you can find poke almost anywhere. Whether it's at the local grocer, Costco, or at the back of a liquor store, every place has it's own take on poke since Hawaiian cuisine draws it's influence from a multitude of cultures. It's like a melting pot of cuisines - you can find Filipino, Chinese, Korean, Puerto Rican, Portuguese, and Japanese flavours in many dishes, and Chef Hui is reflecting some of that influence in his menu. 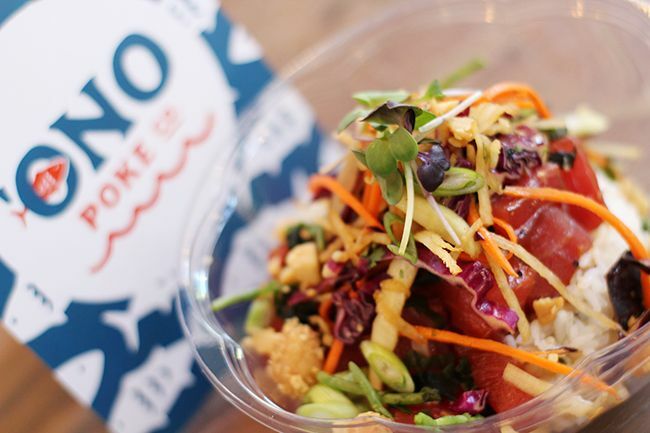 'Ono's chef-driven menu will offer six different poke bowls, featuring Ahi Tuna, Atlantic Salmon, Albacore Tuna, braised pork, and a vegan/gluten free bowl using a variety of beets. 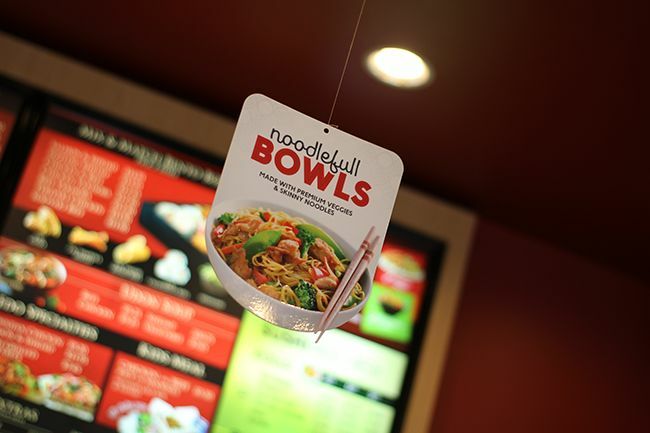 Bowls are available in regular (6-8 oz. | $11.95-$14.95) and large (14 oz. | $13.95-$16.95) sizes and have the option to be built on a bed of furikake seasoned rice, seasoned quinoa, or a spring mix salad. 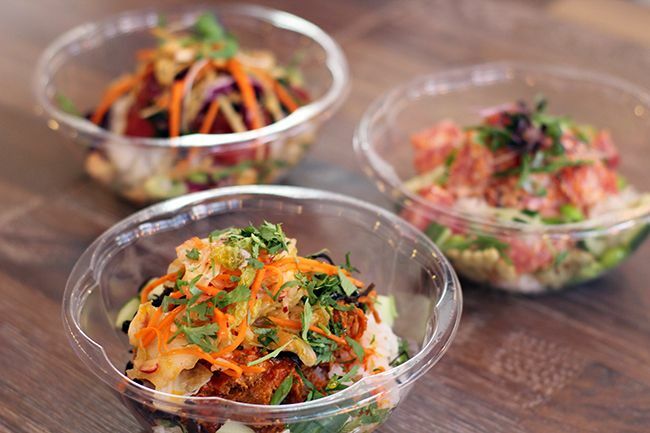 Two special poke bowls will be on rotation daily, and there is also the option to pick up marinated poke (at a market price) or a variety of sides to go like housemade kimchi, japchae noodles, and taro chips. The proteins, slaws, and garnishes are sourced locally whenever possible, so it's nice to know that the poke is sustainable! 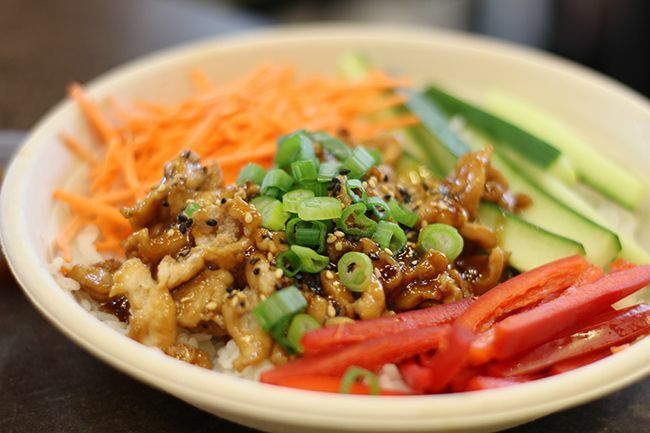 The first bowl we tried was the 'Ono Poke, this shop's namesake dish. 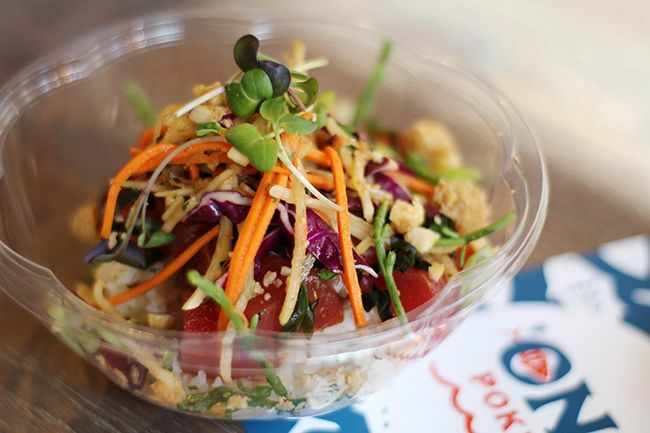 The 'Ono Poke features chunks of ruby red Ahi Tuna mixed with shoyu, sesame oil, ginger, seaweed, and white onion, and then is topped with macadamia nuts, a sprinkle of Hawaiian salt, sea asparagus, green onion, and Asian slaw (red cabbage, daikon, carrot, cilantro). It's poke in one of it's simplest forms and it really is delicious. The tuna is cut into large chunks, is well marinated, and is a fair portion size. The slaw and macadamia nuts offer some freshness and crunch, while the strands of sea asparagus bring a hit of briny flavour from the sea. Next up we tried Uncle Tom's Surf Poke, named after Executive Chef Tom Muromoto of the Ka'anapali Beach Hotel. Chef Muromoto used to be a pro-surfer and actually took Chef Hui out to surf one morning during his trip, so this bowl is aptly named. 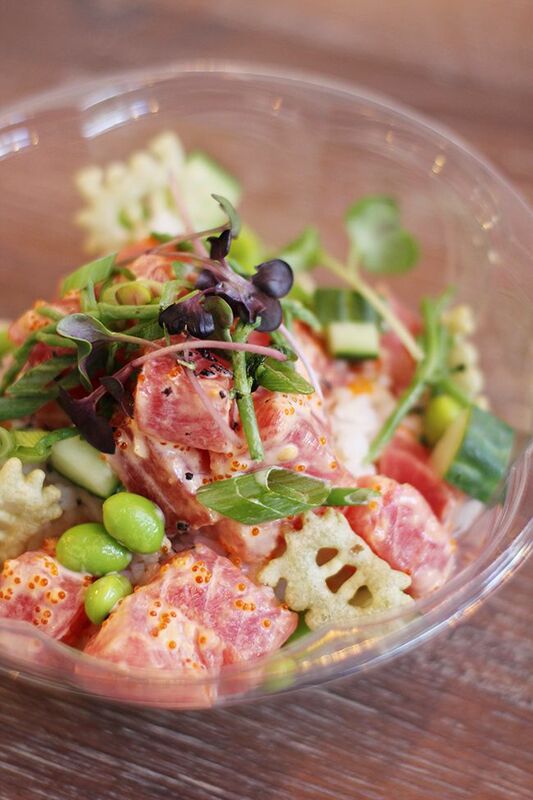 This poke features Ahi tuna mixed in a spicy tobiko aioli with white onion and topped with cucumber, edamame beans, green onion microgreens, sea asparagus, and wasabi crab chips for crunch. Hawaiian's love their mayo, but I appreciated that the aioli wasn't heavy and didn't overpower the natural flavour of the tuna. The tobiko gave the dish some additional flavour with each pop, while the cucumber and beans brought freshness and texture. And those crab chips? So addicting I could eat a whole bag. Last but not least was Chef Hui's modern take on poke with the Prairie Luau. If you like something with a bit of heat, this one is for you! 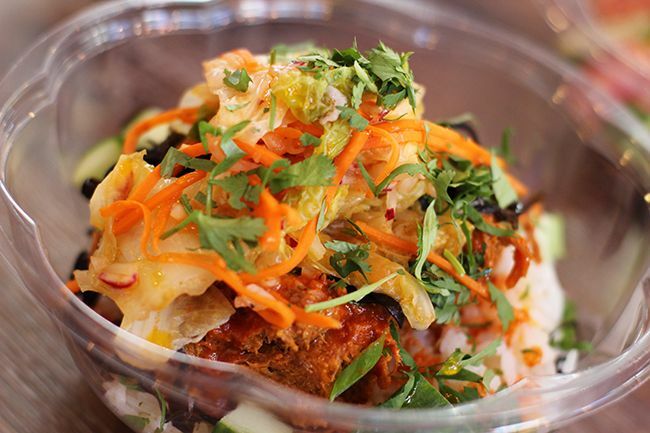 Gochujang braised pork is shredded and paired with a gochujang vinaigrette and garnished with Chinese black fungus mushroom strands, cucumber, white onion, housemade kimchi, green onion, and cilantro before getting a drizzle of Evoolution's Harissa olive oil. 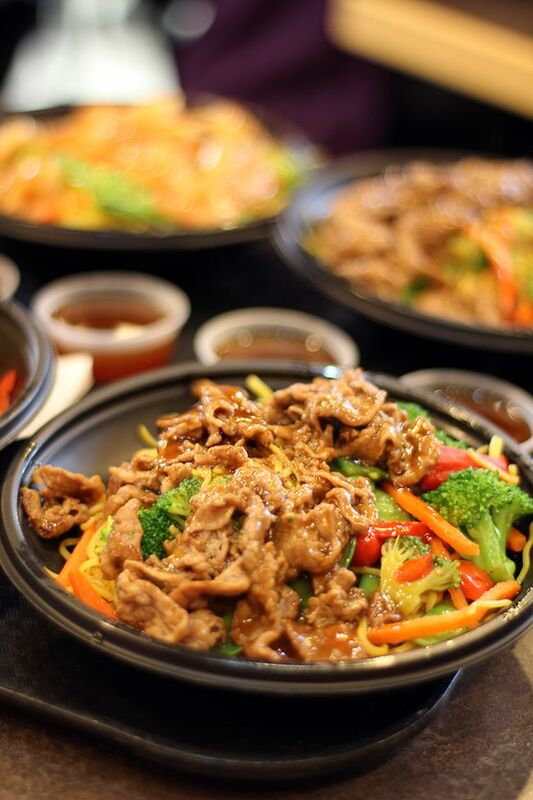 While the bowl isn't overly spicy, it sure packs a punch in flavour. If you're a sweet and spicy fan ask for a scoop of 'Ono's pineapple mango salsa on top - it brings the bowl to a whole new level. While 'Ono has yet to open it's doors officially, I can confidently say that Edmonton has a lot to look forward to. 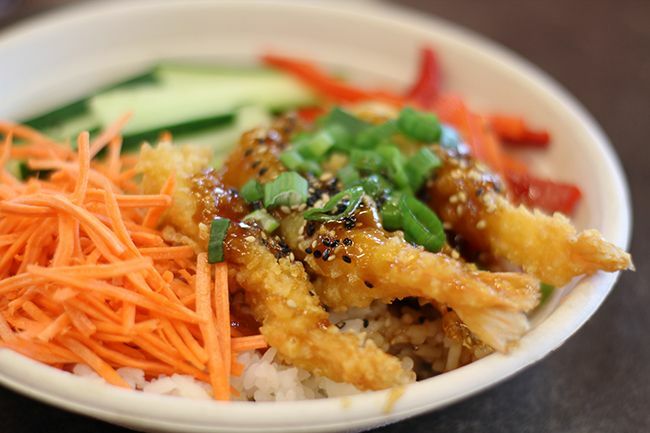 The fish is fresh and appropriately seasoned, and the bowls well portioned and balanced. I'm definitely looking forward to return to try the other bowls on the menu and see what kind of specials 'Ono will come out with. Hawaiian style shaved ice is also in the works, but it will be a few weeks until it makes its debut, so stay tuned! Chef Hui has worked hard to bring an authentic taste of Hawaii to the prairies, and 'Ono Poke Co. will surely make his mentors in Ka'anapali proud. *Disclosure: I was invited to a casual sneak peek at 'Ono Poke Co.. Views expressed in this post are solely mine. This post is 100% my opinion, and as always, my priority is to you, the reader, to present an unbiased, thorough review.